Angel’s Madagascar frog, as the name suggests lives exclusively in Madagascar and can be found only in south eastern Madagascar. These hard of hearing frogs are primarily nocturnal and make their home in the rushing torrents of Madagascar’s forests. Sadly Angel’s Madagascar frog is currently listed as endangered due to threats like human expansion, deforestation, agriculture and human consumption. 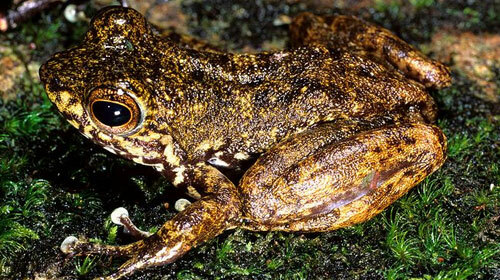 Angel’s Madagascar frog is found in Midongy-du-Sud national park and Andohahela national park, both of which are in close proximity in south east Madagascar. The preferred habitat of Angel’s Madagascar frog is that of fast flowing streams usually within mature forests. 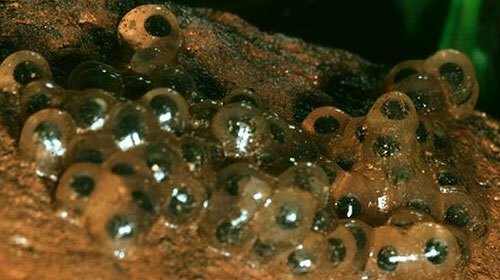 Although mature forests are preferred these frogs can be found in pristine and degraded forests also. Granite stones are common in Angel’s Madagascar frog’s habitat and this shows as it can be hard to spot these large frogs due to distinct green/brown coloration that resembles the surrounding granite. While the skin of Angel’s Madagascar frog is grainy on top the skin becomes smoother around the frogs underside which is usually white and sometimes carries black spots. This large frogs which can grow up to 80mm is thought to not use mating calls at all due to that fact that its habitat of fast flowing rivers dulls sound, on top of this the frogs have very small eardrums. Angel’s Madagascar frog sports large wide hands that aren’t webbed at all which draws contrast to their hind feet that are completely webbed. Making their home in fast flowing forest rivers littered with large stones and rapids, certain details about Angel’s Madagascar frog are still unknown such as precise breeding patterns and tadpole development. If there is not be any hope of leaning more about Angel’s Madagascar frog we need to first consider the vulnerability of this species.